I love the first lacey ones. hehe no more naked cupcakes. That's funny. The doilies look cute an all, but would it be annoying to get the cupcake out of there if they're smaller than the dressy liner? Or I guess you could be a beast and just drop the whole cupcake in your mouth! And that's the spirit, Dorkys. Throw the whole thing in. I like the doilies. I enjoy anything with doilies embellishing it, to be honest. what fabulous looking cupcakes...look too good to eat! Maybe I should Google "DIY side-accent-thingies" for a new post topic. I think that's exactly what they're called. It's like little lovely skirts for little mini cakes, I wonder if you could make manly cupcake pants? I was really looking for something like this. Birthday treat making is coming up and this would be wonderfull as decoration. And a lot easier then my other wild plans. Gosh! You can't have any naked cupcakes can you. Perfect! I just made a cupcake get well card today and was going to make cupcakes to go with it. Now I have some ideas to play with! I love all the awesome-ness that you find! I especially love the doily ones! I would be happy if the cupcake craze faded...never having been a huge cake fan, little baby cakes in a cup were never that enticing. 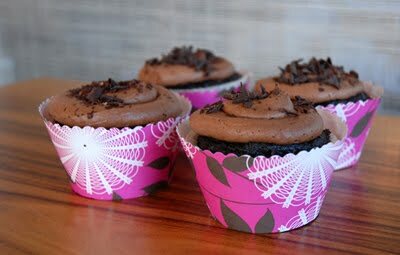 I just blogged about the cupcake craze this morning...actually, I was wondering aloud if it's losing some steam. Two new frozen yogurt shops just opened in my town and I randomly saw another one in a different city. Is frozen yogurt the new cupcake? Haha. I think cupcakes and froyo will coexist for awhile, and then cupcakes will fade. You're right; frozen yogurt places are popping up everywhere. To the point that I roll my eyes when I see another one. I like fattening ice cream, myself. I love these, so pretty. That is too cute! We make our own cupcakes but I don't like buying the wrappers with characters but this is just cute. such perfect timing! I literally sat down in front of my computer to look for cupcake liners for my sister-in-law's shower on Sunday- Seriously! That's what I was going to look for!! Good think I looked at my RSS feeds first. Thanks! If I made cupcakes, I'm afraid they might be going out in their underwear. If I made cupcakes. But I don't. A whole big naked cake is plenty good for me. Very cute use of doilies. Thanks for the diy because as cute as some of the wrappers I have seen are, I cannot bring myself to buy them. I love the naked cupcake reference. It is funny that people find it necessary to dress up their cakes but still go to the grocery store in their pyjamas. If anyone has a silhouette digital craft cutter, their online store also has some super cute cupcake designs! I like to use Halloween cupcake liners all year round - BECAUSE I CAN. It's quite upsetting to the purists. I just love these and can't wait to try them out. The fancy store bought ones are a fortune! Thanks! Love these! I linked to them on my blog, I hope you don't mind! Thanks for the templates. They're great. Love these...so delicate and yummy! awe I love them! how adorable! Thanks Jessica! So, I live in Alaska, and I was completely taken aback when I realized there was a cupcake frenzy downstates. Anyway, I want to thank you for blogging (after a year or so of religiously coming back to your site). I appreciate you sharing your creativity with the rest of us! I didn't know cupcakes were not supposed to be naked! But now that I see them dressed, can I ever, in good conscience, ever, let a naked cupcake leave my kitchen? The wifey is going to love these. 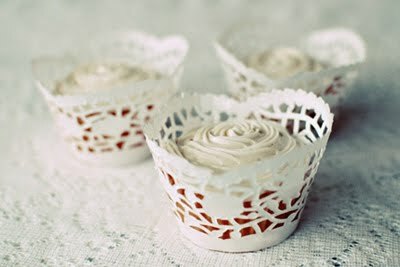 So, do you bake the cupcakes in regular liners and then wrap them with the doilies? or bake them just in the bare muffin tin? thanks for this cute idea! I'd probably use a plain white liner. It might keep some of the grease from getting into the doily.